Towering, snow-capped mountains, waterfall hikes, natural hot springs tucked into valleys, golden galaxies of aspen trees in the fall—Colorado puts on quite the show. The state is packed with Instagram-worthy photos around every (hairpin) curve, from the northern Front Range to the southern valley. But a few destinations stand out as the shining stars. These are the kinds of places that will take your breath away. So stunning, they seem impossibly otherworldly. Here are the 12 most beautiful places in Colorado, in no particular order. The Garden of the Gods, in Colorado Springs, is a National Natural Landmark and one of the most amazing places in Colorado for its towering rock formations that seem to defy physics. These monstrous red rocks perched along a fault line were actually uprooted and tossed about during the earthquake that formed the Rocky Mountains and nearby Pikes Peak. What remains today: a free, 1,367-acre park with trails winding between a natural attraction like nowhere else on Earth. Towers. Boulders. Spires. Rocks that resemble fun shapes, like kissing camels and praying hands. It’s no wonder the Garden of the Gods is the most visited attraction in the Pikes Peak area. Also scenic nearby: The Cave of the Winds, remarkable, 500-million-year-old, underground, naturally-occurring caves. You can walk through these caves and underneath Colorado Springs; the view is amazing, though the photo opps in this dark world are not so much. Mesa Verde National Park, in southern Colorado not far from Durango, is stunning not only in its physical display but also in its depth and history. Mesa Verde is home to some of the best-preserved Ancestral Pueblo sites in the nation. Here, you will find dramatic cliff dwellings built into the sides of steep mountainsides and underground “kivas,” ancient circular rooms made out of stone. This UNESCO World Heritage Site features more than 5,000 archeological sites that you can hike, walk through, climb, and drive past. Impressive highlights here include the massive Cliff Palace and Balcony House, which you can only access by climbing a high ladder and scrambling through a narrow cave. The ancient sites, rock carvings, and remnants of the past are the easy highlight, but the panoramic views across the plateau and deep into valleys are also amazing. Head to San Luis Valley in southern Colorado for these views, ones that are far from what you’d expect to find in land-locked Colorado. This park is home to the nation’s tallest sand dune. Prepare to be amazed by towering sand dunes with purple mountain peaks (the Sangre de Cristo mountain range) in the background. In the foreground, there's a calm creek that you can splash in. This national park is equally as impressive as it is surprising. Rent a sled or snowboard and go “sandboarding” down the peaks. Hike the dunes if you’re up for it (it can get excruciatingly hot); best to set out early in the day when it’s cooler. The tallest dune, the Star Dune, reaches 750 feet. Colorado is home to four different national parks, all of which are different and beautiful in their own way. But one place that takes our breath away year after year is the Black Canyon of the Gunnison National Park near Gunnison and Montrose. There’s something unreal about the black mountain walls of the narrow gorge. A favorite photo here is the unusual Painted Wall, named for the series of intricate pink-white markings crawling across the dark, 2,300-foot-tall cliff. This rock face shoots up from the Gunnison River, earning it the honor of the highest vertical rock wall in the state. You can experience this park in a variety of ways, such as hiking, camping, and kayaking. There are so many amazing points to visit in the southwestern area of Colorado near Ouray that it’s impossible to narrow it down. But luckily, this one highway crosses many of them. The Million Dollar Highway is one of the most beautiful road trips in Colorado; it gives tons of photographic-worthy bang for your buck, all without you having to get out of your car. This highway itself is not long; it’s only about 25 miles long (winding, hairpin miles). But there’s so much to see along the way. Stop in the historic mining town of Silverton, which is still bustling today, and gaze at the colorful, Victorian buildings that line downtown. Then visit a ghost town. Animas Forks also used to be a mining town, but this one was forgotten after the gold rush died down. You have to access it via four-wheel-drive, but if you don’t mind the small diversion, a mountain ghost town is a quintessential Colorado tourist stop. See abandoned, wooden shacks and the echo of a time past. The Million Dollar Highway also brings you past ancient hot springs, like the Trimble Spa (which has a history dating back to Ancient Pueblo people in 1000); the San Juan National Forest (1.8 million acres for outdoor adventure); the charming, small town of Ouray (perched in a circular valley with multiple hot springs); and the Box Canyon waterfall (285 feet tall). Maroon Bells, near Aspen, are two of Colorado’s most famous mountains and well known for their views. They are among the most photographed mountains in the country. The views of the Rocky Mountains all come together in this perfect blend of alpine lakes, meadows, and forests. Also in this area: Independence Pass Summit, which is one of the best routes to drive to see the changing of the aspen leaves in the fall. This high mountain pass offers endless views. Plus, you can see more fourteeners (mountains taller than 14,000 feet above sea level) than at any other place in the state. The Royal Gorge Bridge and Park near Canon City will astound you. You can walk across the highest suspension bridge in the country (if you dare). It’s worth rallying your courage because the views from the middle of the bridge are unreal, stretching in either direction of the valley. You’ll feel like a bird as you look down, down, down 1,200 feet into the canyon of the Arkansas River. You can also experience the gorge via the gondola, where you can sit and take in the views from above. You can also enjoy this view from a different perspective: from below, on the train, or white-water rafting. These rapids get pretty wild, though, so it's far from the relaxing way to do the canyon. Not all beauty comes effortlessly. Bridal Veil Falls near Telluride is Colorado’s tallest waterfall. It spills an incredible 365 feet down the canyon. To access this site, you do have to hike, but it’s not extreme. It’s less than two miles each way and takes most hikers about an hour each direction. Telluride itself is a stunning destination, so after enjoying this dramatic waterfall hike, plan some time to take in the nearby scenery. Telluride is an old, Victorian mining town built in a box canyon. It offers great skiing in the winter, so views here are accessible (and impressive) year-round. This is another of Colorado’s most scenic hikes. 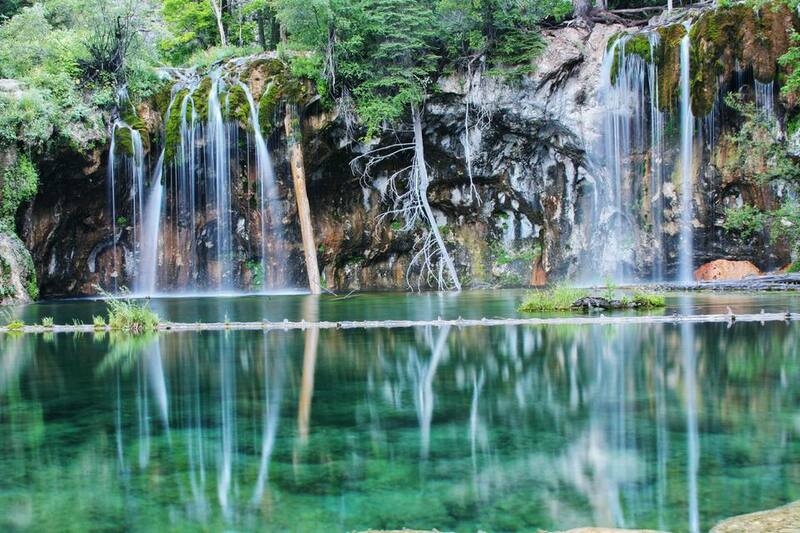 Hanging Lake, near Glenwood, is a magical, geological phenomenon; this crystal clear lake seems to impossibly hang to the edge of the mountain, glowing green from mossy rocks. Gentle waterfalls spill from a cliff into the lake. The rare lake, a national natural landmark, was formed by travertine deposition. Access Hanging Lake by a hike, which is short but fairly rigorous. The trails can get packed in busy season, so hike out early in the morning, preferably on a weekday, and leave no trace. Don’t try to go into the lake or disturb the fragile ecosystem. Trail Ridge Road, outside of Estes Park in Rocky Mountain National Park, shows its beauty in the form of tall mountains—from 12,000 feet above sea level. That’s above tree level. This is the highest continuous, paved road in North America and the highest paved road in any national park. If you stand on top, you can see as far as Wyoming in the north. It feels like you can see to the edge of the planet. The views from atop a fourteener are hard to top. But they’re also not accessible to everyone. Not everyone has the mental or physical ability to endure a grueling hike. Luckily, you can experience a fourteener without having to break a sweat. Pikes Peak near Colorado Springs tops out at 14,115, which means jaw-dropping views. But you can hitch a ride all the way to the top on the world’s highest cog train. Check off two bucket list items at once. The Broadmoor Seven Falls are considered Colorado’s most famous waterfall. This impressive site features seven waterfalls spilling 181 feet down from South Cheyenne Creek. To one direction: the flat prairie. To the other, the steep-walled canyon of the foothills. Look for the Pillars of Hercules, rising 900 feet above the canyon, just 41 feet apart. Gazing at these falls are just the beginning of this attraction. You can go hiking, ziplining, dining, and shopping at this privately owned site. Access Seven Falls through the Broadmoor, a luxurious resort in Colorado (you must take a special bus from the resort to the trailhead because there's no public parking). Unlike some other waterfall hikes in Colorado, this one is not free.